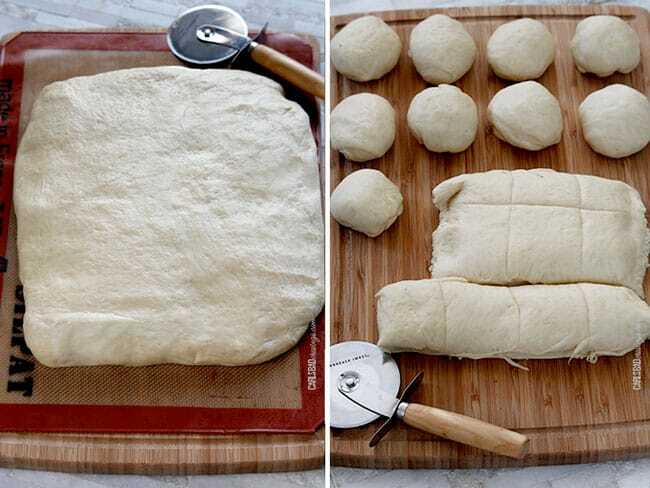 Dinner Roll Recipe with no hand kneading! 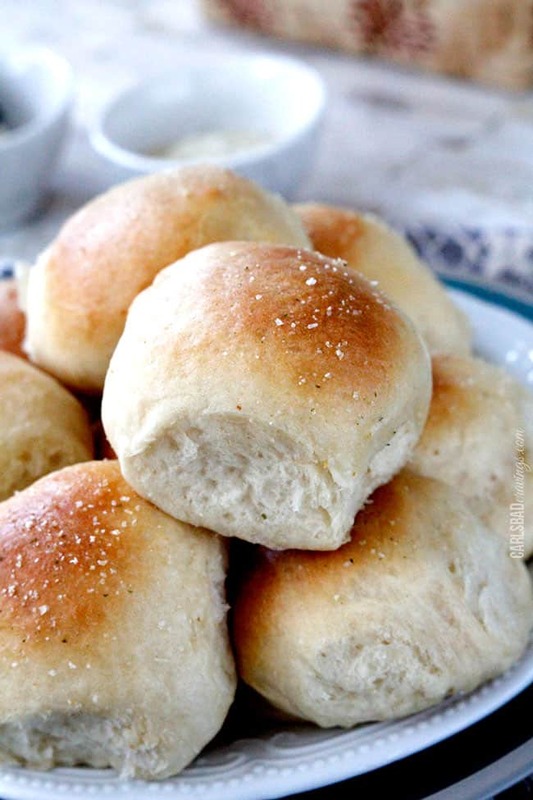 Soft and fluffy, double brushed with butter and topped with garlic salt for the best Dinner Rolls ever! 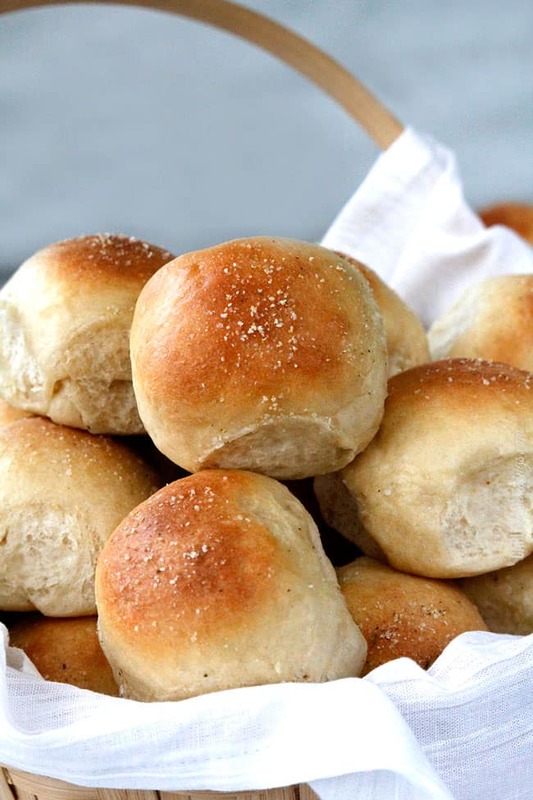 This Dinner Roll Recipe will be the only dinner rolls you will ever want to make. or eat. Out of everything I could be making for Thanksgiving, I am making these perfect, soft and fluffy pillows of deliciousness. And soon you’ll taste why! When I made these buttery balls of bliss last week, I knew Patrick was going to be excited. As soon as the door opened and he was met with their buttery homemade roll aroma, I heard an enthusiastic, “Yes!” as he hurried up the stairs and dove right in. “You have to make these for Thanksgiving!” he exclaimed. He has since conjured up plans to open a food truck with a menu solely based on these rolls because they make “everything taste amazing!” I love the enthusiasm. And I love how just a waft of these dinner rolls brought a smile to his face as he was reminded of happy times – with these rolls in his belly. Isn’t it amazing how memories coincide with smells and food? Just like a waft of pumpkin pie or roasted turkey transports us to happy times of family and friends; times surrounded by the people we love the most – The very reasons for Thanksgiving. I have a lot to be Thankful for this year – and every year – but especially this year as I celebrate my 15 year double lung transplant anniversary on November 29th and just celebrated my 1 year kidney anniversary on October 9th. I’m going to share a special post on that later, but I can’t not think of Thanksgiving without being thankful to be alive and overcome with gratitude to my sister, my kidney donor, and my two living lung donors who have made my very life possible (my lungs were taken out completely at age 16 due to cystic fibrosis and they each donated 1 of their lobes to form a new set of lungs for me – so I have 2 lobes instead of the normal 5). Everyday is Thanksgiving in my life! But still, official Thanksgiving demands special foodie treatment. That’s where these Perfect Soft and Fluffy Rolls come in. Seriously, I will never make another dinner roll recipe again. 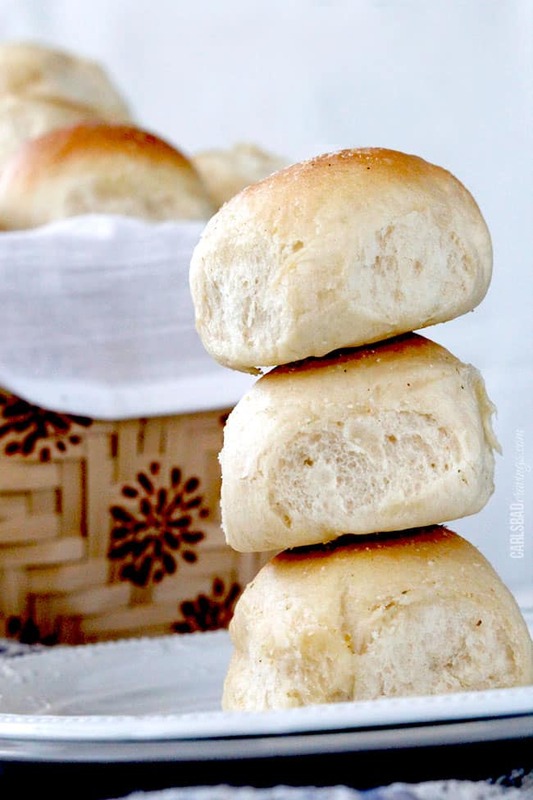 These rolls are super uber soft and fluffy, smothered in butter before they bake then smothered in butter again after they bake because, after all, you are taking the time to make homemade dinner rolls – they better be buttery! Just as they better be melt in your mouth delicious. Done and done. The last extra “something special” that pushes this already perfect Dinner Roll Recipe into a whole new realm of unspeakable deliciousness (as in you can’t speak because your mouth is stuffed with roll after roll after roll), they are gifted with a sprinkling of garlic salt. 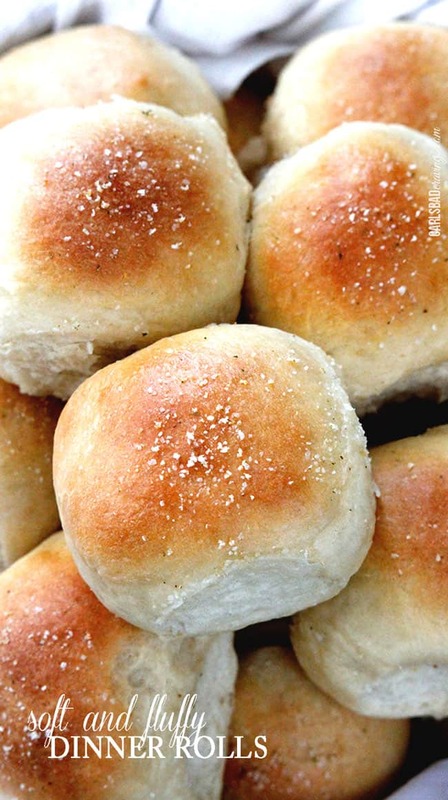 It enhances all that’s right in the world these dinner rolls. I hope this Dinner Roll Recipe joins you this Thanksgiving and for many Thanksgivings to come and that their freshly baked bread aroma fills your soul with reminiscent foodie and family memories and present thanksgiving! Dinner Roll Recipe with no hand kneading! Soft and fluffy, double brushed with butter and topped with garlic salt for the best Dinner Rolls ever! This Dinner Roll Recipe will be the only dinner rolls you will ever want to make. or eat. Add milk to a small saucepan and bring to a simmer. Remove from heat and stir in 1/2 cup butter and sugar until melted. Place in the refrigerator to cool. Fix mixer with dough hook and generously spray hook with nonstick cooking spray. Shape the dough into a ball and place back into your mixing bowl that has been coated lightly with olive oil or nonstick cooking spray. 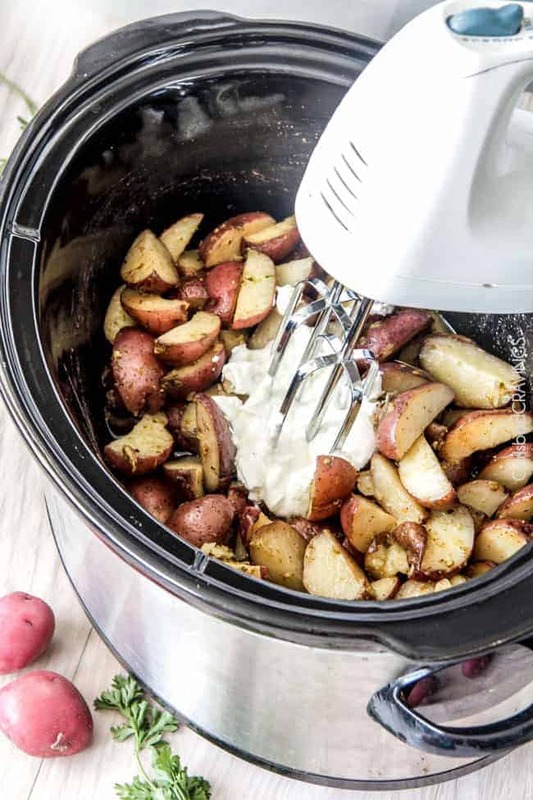 Cover tightly with plastic wrap that has been sprayed with nonstick cooking spray and allow to rise at room temperature until doubled in size, about 1 1/2 -2 hours. After dough has doubled, remove to a floured surface (or nonstick mat) and punch down then lightly shape into rectangle of uniform thickness (overall dimensions don’t matter) using your hands. Cut the rectangle into 28 roughly even pieces then shape into balls by folding the corners under. Place balls about 1 inch apart on a baking sheet lined with a nonstick mat or parchment paper. Cover with a towel and let rise until doubled, 45-60 minutes. Preheat oven 350 degrees F. Brush rolls with approximately 1 1/2 tablespoons melted butter. Bake for approximately 20 minutes or until golden. Remove from oven and brush with remaining butter and sprinkle with garlic salt. 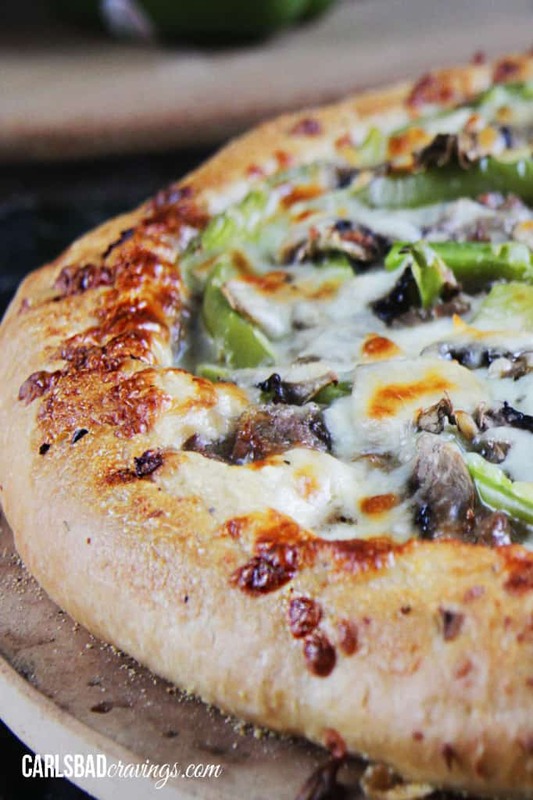 *If your dough is too wet, add 1 more tablespoon of flour at a time until dough barely sticks to your fingers. 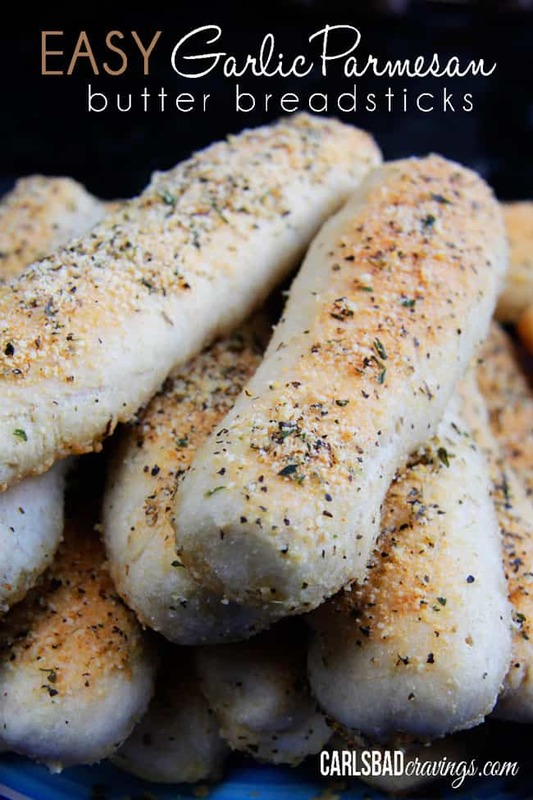 Want to try this Dinner Roll Recipe? Pin it to your BREAD, DINNER, or HOLIDAY Board to save for later! Love making my own dinner rolls. These definitely do look soft and fluffy.. great recipe! Thanks so much Thalia! 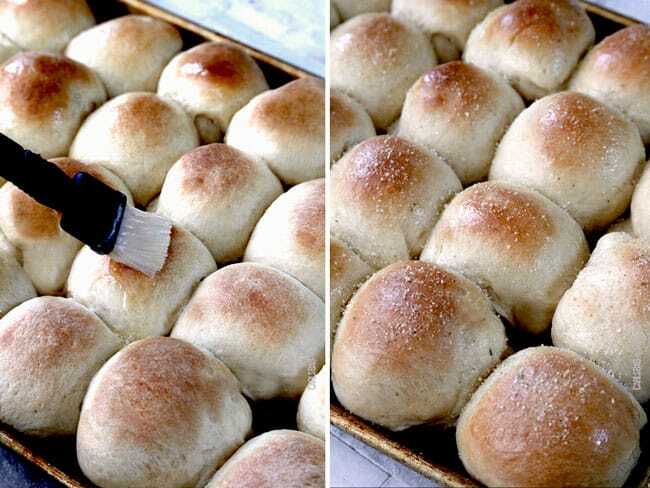 Agreed, homemade rolls are the best! The directions say total time is 50 minutes. Here I am making these rolls and realize they have to rise for 1 1/2 -2 hours. That’s longer than 50 minutes. You may want to change that on your recipe. Can’t wait to try them but they’ll have to be a midnight snack for now. I am SO sorry Laurie, I don’t know how that happened! I am editing the recipe right now – thanks for letting me know! Hi Penny, yes you absolutely can make them the day before! Let the dough rise the first time. Shape dough and place on baking sheet as directed. Lightly spray tops of rolls with nonstick spray, then cover the pan with plastic wrap. 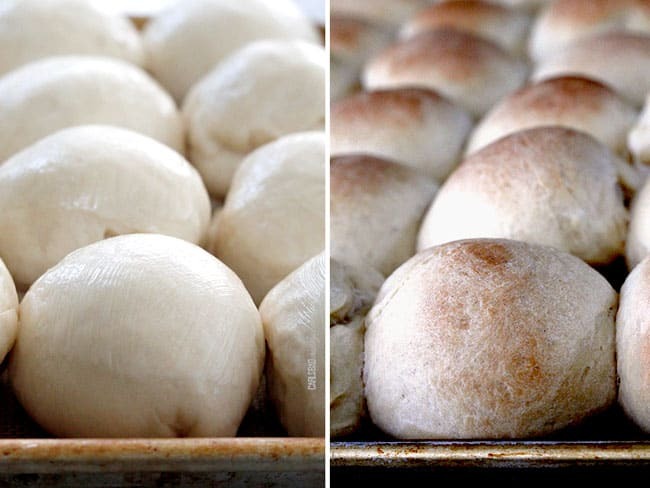 About 60 minutes before you want to bake the rolls, take them out of the fridge. They should have risen some but allow them to finish rising while they come to room temperature, 30-60 minutes. Bake as directed in a preheated oven. What a great looking roll. Can’t wait to try. What an inpspiring story and God bless. Thank you so much Rebecca! God bless you and yours too! Hi Nagi! It so good to keep running into you! These rolls are definitely a keeper, I hope you enjoy! I loved your story and would like to try your rolls but was wondering if the recipe could be cut in half? Thank you so much Camille! Yes, this should be able to be cut in half no problem. 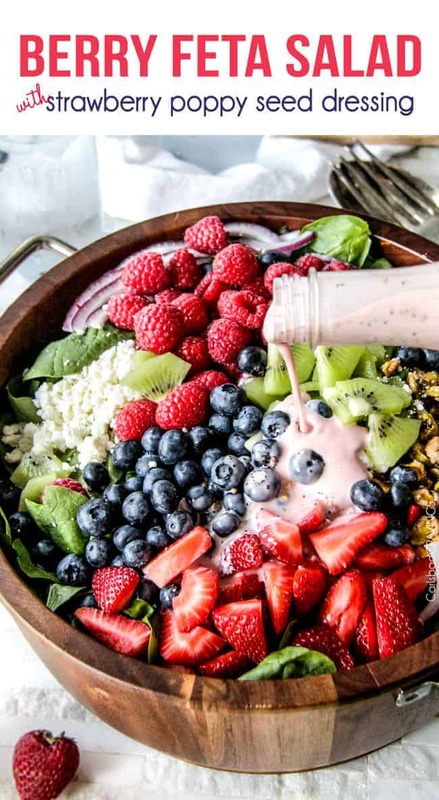 Just found this recipe and read your story, beautiful! You truly do have a lot to be thankful for everyday! We all do but maybe not to the extent you do but thankful all the same. I do have a question; how far in advance of my meal can I make this recipe saying my meal is to be served between 6:30-7:00? You are so kind, thank you Victoria! These rolls keep very well in an airtight container or plastic bag, so you can make them as early in the day as fits your schedule. To warm them, I suggest topping them with a slightly damp towel or paper towel and microwaving for a few seconds. Enjoy! Can’t wait to try these out! But my question is after they’ve risen for the second time and in ball form, can I freeze them in a freezer bag? Hi Mary! I have never frozen them but I have frozen pizza dough, so I would think it should be the same. Just make sure you grease the plastic wrap before freezing them. Let me know how they turn out! Good luck! Could you use spenda or steevia instead of the sugar? HI Pat, I am sorry I can’t answer that question as I never have used it in any of my recipes- only sugar. Sorry I can’t be of more help! Hi Nicole! I suggest whole milk but I have also made them with lowfat milk and they still tasted great, so basically, whatever you have on hand should work great besides nonfat. Enjoy! How many rolls “roughly” does this recipe make? Thank you! Hi Peggy, this recipe makes 28 rolls. Enjoy! Thank you so much for sharing this recipe!!! I made these today and sliced them to use as buns for sliders – this is the best homemade roll Recife I’ve ever had! You are so welcome Jen! I am thrilled you loved them so much and they sound AMAZING for sliders- yum! I JUST pulled these rolls out of the oven, and I am ecstatic!!! These are THE best rolls I have ever made. I have struggled with making homemade rolls, but not this time! They are perfect! Thank you for SUCH a great recipe. Next is the Million Dollar Macaroni and Cheese. Can’t wait to try that one too. I LOVE your comment LaTia, thank you! I am thrilled these were a huge success! And your menu sounds delicious! I hope you loved the Million Dollar Mac just as much! Happy Thanksgiving! Hands down, the best dinner rolls I have ever made. Such an easy recipe to follow too! I’ve made them twice now and both times received rave reviews. 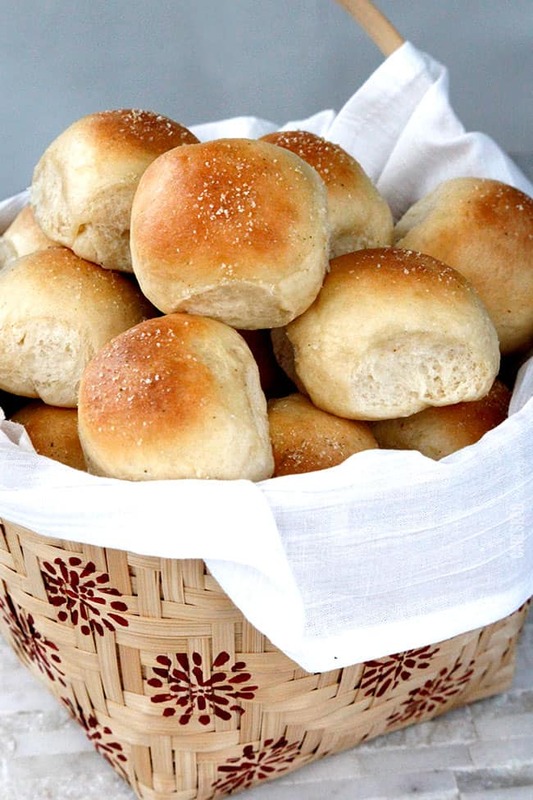 I’m so pleased the were the “best dinner rolls!” And I love your addition of seasonings to the dough – yum!